Transition weather is always my favorite. There’s nothing better than being able to comfortably wear a dress and light jacket but in the south those days are few and far between! It will definitely still be pretty warm around these parts for a while so I’ll be transitioning with lightweight pieces and fall colors. Blush and navy is currently my favorite color combo and this short sleeve sweater from Gap turned out to be the perfect compliment to my navy camo Zara skirt! I just picked up this sweater on sale at Gap a few weeks ago and it turned out to be the perfect piece for this month’s Bloggers Who Budget collab! 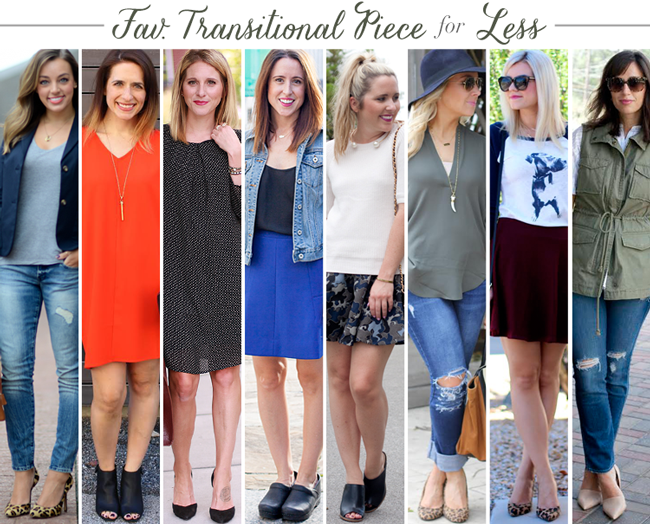 Don’t forget to check out everyone’s favorite transitional piece below! Oh my goodness I need to steal that camo skirt. That sweater is perfect. For everything. I love those shoes too! This skirt is seriously gorgeous, I love the metallic and print!